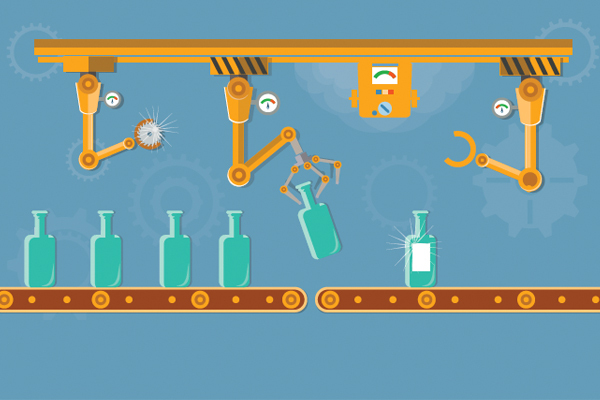 While robot deployment in the food industry has been slower than in some other sectors on-going technology developments are leading to greater opportunities for manufacturers to benefit from increasing the levels of robot automation in their processes. The market for industrial robots continues to grow rapidly, as new use cases and opportunities supplement existing applications. Historically, the majority of industrial robot deployments have been articulated robots primarily used in the automotive industry. In fact, according to IHS Markit as recently as 2012 almost half of all industrial robots sold globally went into the automotive sector. However, growth areas for robots has expanded to general industries such as the food and beverage and the consumer electronics industries. This has accelerated as costs have lowered, performance and dexterity have improved, manufacturing wage costs have continued to increase, as well as some re-shoring of manufacturing. Within the food and beverage industry, one which is controlled by strict health & safety regulations, robots have previously been limited to tertiary and some secondary packaging tasks, such as palletizing, as they have not met necessary standards to be used in direct contact with food. However, manufacturers are increasingly developing robots with a high protection class suitable for handling unpacked goods and subsequent wash-down, creating new opportunities for the direct and indirect handling of foods. The food industry, with its greater immunity to economic uncertainty is also a target market for many robotics companies, as an area less influenced by cyclical swings in demand, therefore offering greater stability. As such companies have released new robots suitable for the sector.